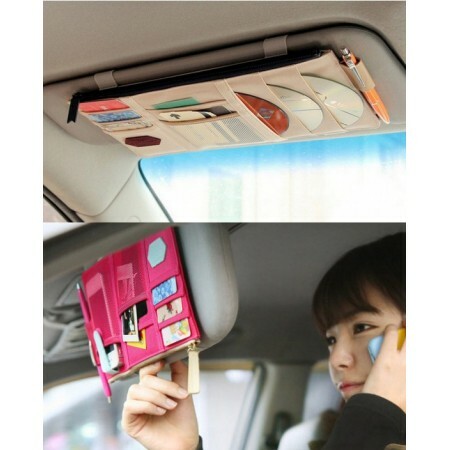 This car visor set includes two neat pockets that easily slide over your car visor. Store keys, cards, CDs, phones and other everyday items at arms reach and never be forced to rummage through your glovebox while driving. https://www.e-ville.com/en/3034-other/13515-2x-car-visor-pocket.html 13515 2x Car visor pocket http://www.e-ville.com/img/p/13515-58353-fb.jpg 4.95 GBP InStock /Car Products/Other /Car Products 15.95 This car visor set includes two neat pockets that easily slide over your car visor. Store keys, cards, CDs, phones and other everyday items at arms reach and never be forced to rummage through your glovebox while driving.